Rinse the tomatoes and remove the peel, then discard the seeds. Cut the tomato into pieces. Wash the peppers and discard the seeds. Cut these into small pieces. Peel the garlic cloves and cut into chunks. Crumble the bread into small pieces. You can also always use a little bit of water soaked bread (I always do), but this is not really necessary. Put it all in a bowl and mix while gradually adding the oil and vinegar it, until the mixture reaches the consistency of a thick soup. 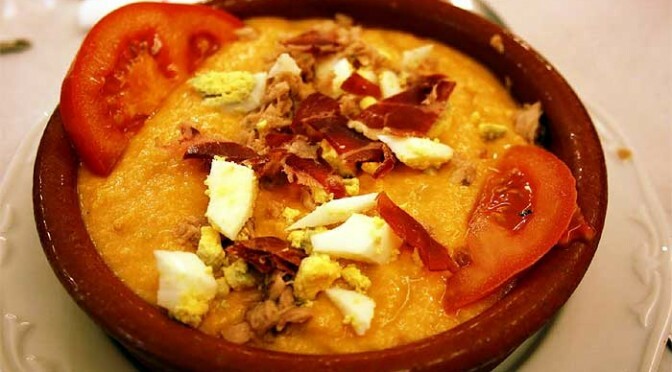 Serve the soup cold with crumbled egg, bits of serrano ham and bread cut into wedges and placed on top. Instead of serrano ham, many people often substitute tuna and/or slices of tomato.